There isn’t anything special here, at least as far as the eye can see. There are no natural boundaries or landmarks. No buildings or structures of note. Even the surrounding scenery is unremarkable. Only a small plaque identifies the significance of this particular point. As with many silly things in American life, this one started with an act of Congress. Rather than drawing the boundary of the new Arizona Territory along objective geographic lines, they defined it as starting at the corner where the Colorado Territory ended. 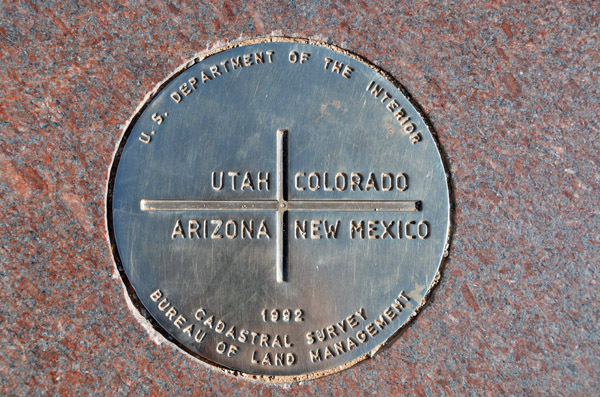 This prevented subsequent changes in geographic surveys from shifting borders relative to one another and breaking up the only point in the U.S. where four states meet. Little did they know that nearly 150 years later this small decision would cause thousands of people each year to drive hundreds of miles into the middle of nowhere to do things like this . . .
Brian visits four states simultaneously. Weeeeeeee! Yup! Been there, done that! Belly laughing again! I’m one of the thousands….. like you said, what else is there to do there? Still, it is fun! Oh, I’d love to do that! I was born and brought up near the Greenwich Meridian, where you can stand with one foot in the east, the other in the west, and that is pretty cool too! I remember a Simpsons episode where they did that while holding hands and then moved to a different state. Sometimes I don’t know what’s real and what is Simpsons creativity… glad to know it’s real! 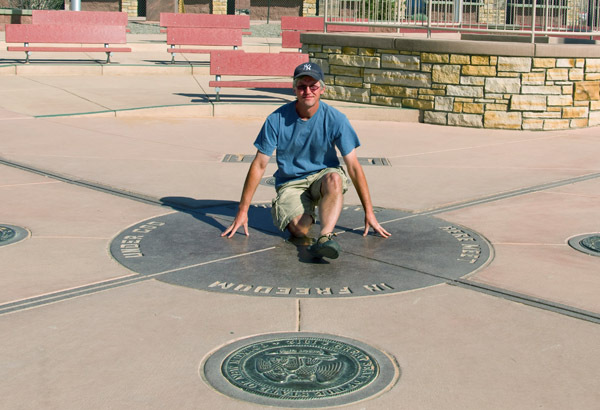 I’d heard about the Four Corners, but didn’t think much about it until your post. Knowing the why of things is always interesting. And, as usual, your post reminds me of something—another geographic dividing line: The city of Istanbul in Turkey is split. Part of it is in Europe, the other part, Asia. I could walk across the Galata Bridge from Europe to Asia in just a few minutes. Wow, someone added benches. When I was there 35+ years ago all I saw was a mangy stray dog, and the marker. That’s America, In Europe Frontiers are the results of centuries of bloody battles and slaughters!! !